I am sometimes asked, “Andy, how do I start a technical blog?” I demonstrate one way here – a way that has served me well with search engines. 1. Describe how the error occurred. 2. Copy the error message, post it as text. Step 1: Convert the existing data integration operations to SSIS and test the conversion by deploying to an on-premises SSIS Catalog. Step 2: Lift and shift the SSIS Catalog configurations from on-premises to Azure-SSIS (we will be using SSIS Catalog Compare for this part). Self? Could it be the odd-looking name of the Project Connection Manager? 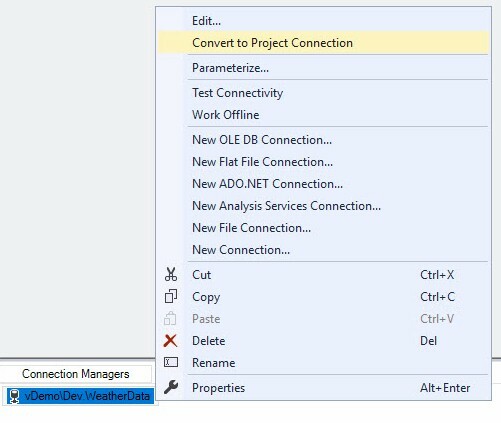 When you create a new SSIS Connection Manager, SSIS automagically names it for you. Awesome, right? Most of the time. But sometimes the default name created for a package connection manager doesn’t play nice with Project Connection naming requirements. Create a new SSIS package. Failed to convert the package connection mananager ‘vDemo\Dev.WeatherData’ to a project connection manager because ‘vDemo\Dev.WeatherData’ is not a valid stream name in the project. Rename the package connection manager and do the conversion again. Object name ‘vDemo\Dev.WeatherData.conmgr’ is not valid. Name must contain only alphanumeric characters or underscores ‘_’. The backslash – “\” – in the connection manager name – which works just fine for the Package Connection Manager – blocks promotion of the package connection manager to a Project Connection Manager. SSIS is a complex and flexible software development platform. I learn new things with each and every consulting project. Why did I think of the connection manager name? In testing SSIS Catalog Compare version 4, I tried out a bunch of naming combinations. I was shocked to learn some characters are permitted (did you know you can create an SSIS Catalog Folder name that contains an apostrophe??). Next PostNext Enterprise Data & Analytics Welcomes Eugene Meidinger!